Recently I made some photos of various Seattle homes for the Seattle interior designer Robin Chell Design. 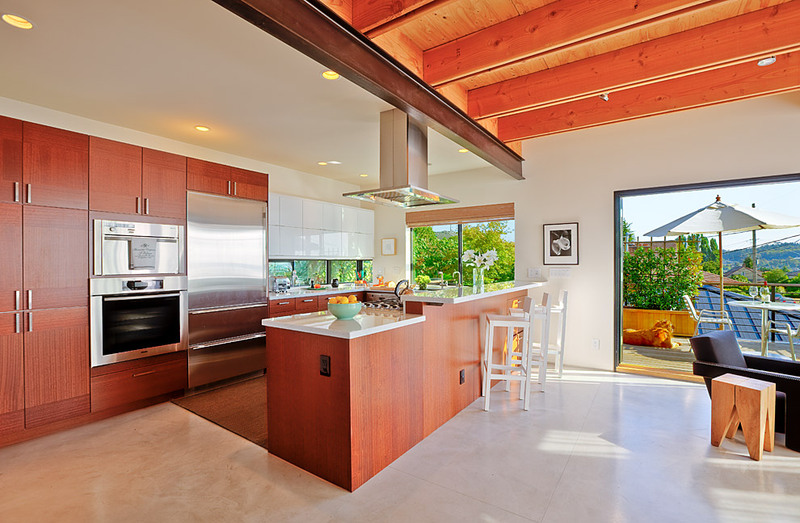 This one is quite a modern kitchen but has a great feeling of spaciousness. I would love to hang out there with the golden retriever out on the deck. Robin Chell Design provides complete residential and commercial interior design services, including design concept, space planning, interior specifications, furniture, finish and fixture selection, custom furniture design, art procurement, and lighting specification. Photograph by Seattle Photographer Daniel Sheehan specializing in photojournalism, portraits and photography for publications and corporations, and a wedding photographer, candid wedding photography with a photojournalists style. This entry was posted on Saturday, April 3rd, 2010 at 12:19 pm	and is filed under ARCHITECTURE, CORPORATE, PLACES and tagged with Architecture Photographers, Architecture Photography, Interior Design. You can follow any responses to this entry through the RSS 2.0 feed.